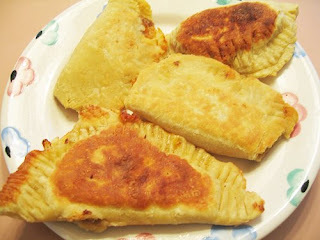 Our bean challenge dinner this past week was homemade empanadas. I've never made them before and decided to make both the refried bean filling and dough from scratch. My challenges to myself are not usually without mistakes. But like I tell my daughter...it's OK to make mistakes, because that helps you learn. The same applies to me & my home cookin'. If you don't know what empanadas are, they're pastries stuffed with either meat/beans or a sweet filling. Being my first time making these, I made the mistake of making the dough too thick. Next time I'll be more patient and keep rolling out that dough. Hungry bickering children were all the motivation I needed to get those empanadas in the pan! Here's the link to the recipe I used. I varied it by using butter instead of shortening, used masa harina (corn flour) for one of the cups of flour, and pan fried instead of deep frying. The family liked them, not too many complaints. The suggestion for next time is "use meat". Umm...that's slightly missing the point, but I get it. The other recent bean mistake was omitting the bean challenge from week 29 (gasp!) For as long as I've been doing this, you'd think I would remember. The week slipped by and no bean dinner. Oddly enough, the kids didn't miss it. I was glad to read you used butter instead of shortening in the empanada dough. Shortening (and margarine) is so bad for people, and despite what many think, real butter is NOT a bad fat.